Information visualization helps people explore or explain data through interactive software that exploits the capabilities of the human perceptual system. A key challenge in information visualization is designing a useful spatial mapping of a dataset that is not inherently spatial and coupling that mapping to interaction techniques that allow people to intuitively explore the dataset. Information visualization draws on the intellectual history of several traditions, including computer graphics, human-computer interaction, cognitive psychology, semiotics, graphic design, statistical graphics, cartography, and art. The synthesis of relevant ideas from these fields with new methodologies and techniques made possible by interactive computation are critical for helping people keep pace with the torrents of data confronting them. Academic integrity: Unless explicitly stated otherwise, you are expected to do your assignments and work on your own. Your project will be a collaborative effort among a group of students. For it, you may use libraries and code fragments from sources on the web that you integrate into an overall working system. Your source code should indicate what code is imported and used as is, what code is imported and modified, and what code is original. It is appropriate to discuss your project with others to gain ideas and feedback and help with sticky problems. It is not appropriate to find an existing infovis system, modify it and submit it as your own work. If in doubt, confer with your instructor. All students are expected to adhere to the Georgia Tech Honor Code. 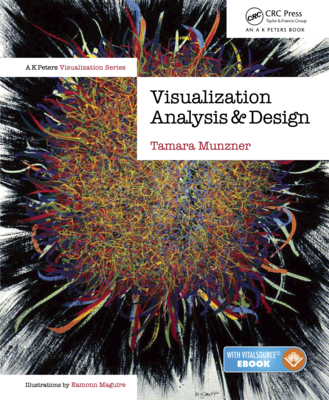 Visualization Analysis and Design (VAD), Tamara Munzner (A K Peters Visualization Series, CRC Press) is the course textbook. It is expected that students will come to class, be prepared by doing the readings, and will pay attention and participate in discussions. Doing all three regularly will earn full credit. If you want to surf the internet on your laptop in class, take another course. Any questions regarding general rules and regulations should first be directed to the Georgia Tech Catalog. If you still have questions, please seek out the TA or Instructor during the posted office hours. All assignments are due at the time indicated in the schedule. Late work is penalized at one letter grade per day starting with the day of submission. For example, an assignment turned in 10min late on the submission deadline is one day late, turning in 24hours 10min after the deadline is two days, and so on. This policy applies in all cases except medical or family emergencies. Too much other work, gone for the weekend, ran out of paper etc. are not emergencies. Stuart Card, Jock Mackinlay and Ben Shneiderman. Readings in Information Visualization, Using Visualization to Think, Morgan Kaufmann, 1999, pp. 1-34. VAD Ch 1. What's Vis, and Why Do It? BallotMaps: Detecting name bias in alphabetically ordered ballot papers. Wood, J., Badawood, D., Dykes, J. & Slingsby, A. (2011). IEEE Transactions on Visualization and Computer Graphics, 17(12), pp. 2384-2391. A Layer-Oriented Interface for Visualizing Time-Series Data from Oscilloscopes. Roberto Lopez-Hernandez, David Guilmaine, Michael J. McGuffin, Lee Barford. Proc. PacificVis 2010, p 41-48. Radial Sets: Interactive Visual Analysis of Large Overlapping Sets. Bilal Alsallakh, Wolfgang Aigner, Silvia Miksch, and Helwig Hauser. IEEE Transactions on Visualization and Computer Graphics (Proc InfoVis 2013), 19(12):2496-2505, 2013. Flow Radar Glyphs -- Static Visualization of Unsteady Flow with Uncertainty. Hlawatsch, Leube, Nowak, and Weiskopf. IEEE TVCG 17(12):1949-1958, 2011. Topological Fisheye Views for Visualizing Large Graphs, Emden Gansner, Yehuda Koren and Stephen North. IEEE TVCG 11(4):457-468, 2005. Tuning and testing scrolling interfaces that automatically zoom Andy Cockburn, Joshua Savage, Andrew Wallace. Proc CHI 05. A Fisheye follow-up: further reflections on focus+context. George W. Furnas, CHI 2006, p 999-1008. Graph-Theoretic Scagnostics Leland Wilkinson, Anushka Anand, and Robert Grossman. Proc InfoVis 05.